Rabbids. They’re the Minions of the gaming world, split off from a far superior franchise and given free rein to wave their obnoxious, slapstick brand of comedy in the public’s collective face. It was with good reason that I approached Mario + Rabbids: Kingdom Battle with some level of trepidation, despite the mostly positive showings leading up to release, but it’s safe to say that my doubts have been well and truly quashed. Not only are the Rabbids far more tolerable when cosplaying as classic Nintendo characters (much in the same way that I would pay good money to see the Minions do a reboot of classic 90’s sitcom Frasier), but the game in which they share a starring role in with the real Super Mario crew is a surprisingly solid turn-based cover shooter. Nintendo’s allowing of Ubisoft to develop a title using its beloved franchise is a bold move for the company, but their faith has been well placed, because this particular mash-up is a bloody great time. Kingdom Battle begins with a simple enough set-up; an unnamed genius/hacker/very irresponsible teenager with a bedroom full of Nintendo propaganda invents a device called the SupaMerge, with the power to merge any two objects into one. Cue a band of mischievous Rabbids rocking up in their Time Washing Machine (a nice little nod to Raving Rabbids: Travel in Time from the Nintendo Wii) and subsequently causing chaos, accidentally using the SupaMerge on their interdimensional front load washer and causing their world to be dropped (unceremoniously) straight into the Mushroom Kingdom. From here, Mario and friends make it their mission to chase down the Rabbid responsible for the whole mess, now accompanied by Bowser Jr, and make things right again. It’s basic, non-intrusive stuff that does the trick as an excuse for Mario, Luigi, Peach and Yoshi to go adventuring through a warped version of the Mushroom Kingdom with their Rabbid doppelgängers. Perhaps the most surprising thing about Kingdom Battle is that there are guns. A lot of guns, in fact. Traditional Mario platformer or wacky Rabbids minigame collection this is not – Mario + Rabbids just happens to be a strategic, turn-based tactical shooter that feels like a little bit like a Nintendo-fied XCOM. This means that most of the time spent with the game will be locked in battle, commanding your band of Merry Mario Mercenaries as they fight scores of twisted Rabbid baddies. Fights play out much like other turn-based strategy RPGs, with each side taking turns to command their individual units to move and attack on a grid-based field, one at a time. 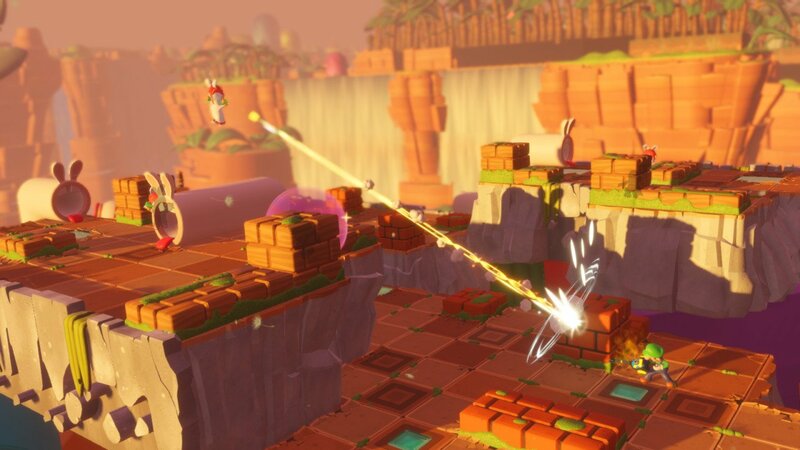 Mario + Rabbids gives each of the player party’s three members the opportunity to move, use one standard attack and one special move each turn, but where things get especially interesting is the plethora of ways in which character actions can be combined or strung together to make devastating (and strategically necessary) manoeuvres. Every character has a set limit (based on their individual stats) of how many places they can move during their turn, but each also possesses the ability to bounce Mario-style off of the heads of other party members to extend their movements even further. Using this move to gain the high ground on the enemy and gain an attack boost is one of the earliest introduced tactics, but coupled with a multitude of warp pipes in the environment, and a dash move that damages any enemy the character moves through whilst moving, it becomes quickly apparent that movement is the name of the game. Instead of the slow burn of traditional tactics RPGs, where both sides slowly make their way towards each other in a slow build up to a showdown, clashes in Kingdom Battle are a fast-paced cat-and-mouse game of leaps and bounds around the battlefield. Equally as important as smart positioning, the act of attacking your various foes starts off in a fairly basic fashion before introducing the player to a tonne of unique mechanics that deepen the strategic potential in surprising ways. Mario + Rabbids is very much a cover-based affair, with every field littered in cover points. Low cover provides a 50/50 chance of a shot landing, while high cover is guaranteed protection from standard gunfire, and both can be destroyed with enough force. Every character has a primary and secondary weapon, that range from basic pistol and sniper-like laser guns (because this is still a PG-rated affair) to homing drones and giant hammers, plus unique special abilities like party buffs and healing. Every turn allows each party member one weapon attack and one use of an ability, and each have their own set cooldowns, meaning carefully balancing the timing and strategic use of each is a must, and using them in tandem with the full range of movement options allows for some impressive and deadly combinations. Further into the game, weapon and enemy variants are introduced that cause status effects such as blinding or freezing an opponent, deepening strategy even further and making Kingdom Battle a far more mind-flexing affair than I had anticipated. In fact, the game starts to really turn on the heat in the later stages, so much so that younger players will probably find themselves resorting to the more merciful ’Easy Mode’ option for the trickier fights. Furthering the need for smart play, winning a battle results in a rating based on total turns taken and characters left standing, and these ratings are tallied at the end of each chapter in reward for extra coins, giving great incentive to really work those strategies and do well in battle. Supporting all this action is a fairly simple and intuitive interface that does a great job of providing the player with a clear understanding of events, and quick access to every command at their employ. Annoyingly however, an undo option for movement during player turns doesn’t exist, useful as it is in other comparable games for correcting accidental commitment to bad moves. More than once I cursed myself for telling Luigi (the superior of the two Mario Brothers, just quietly) to stand right next to a powerful melee enemy instead of hitting them with a dash attack and then moving back out of attack range. Outside of battle, menus are limited to team and weapon selection, and skill trees. Characters in Kingdom Battle don’t accrue experience or level up, but battling well and finding hidden chests earns Power Orbs (?) that allow for upgrading of everyone’s various stats and abilities. Most characters’ skill trees don’t differ terribly (outside of their few unique powers), but the sense of progression and reward for skilled play adds a lot to an otherwise simple experience. 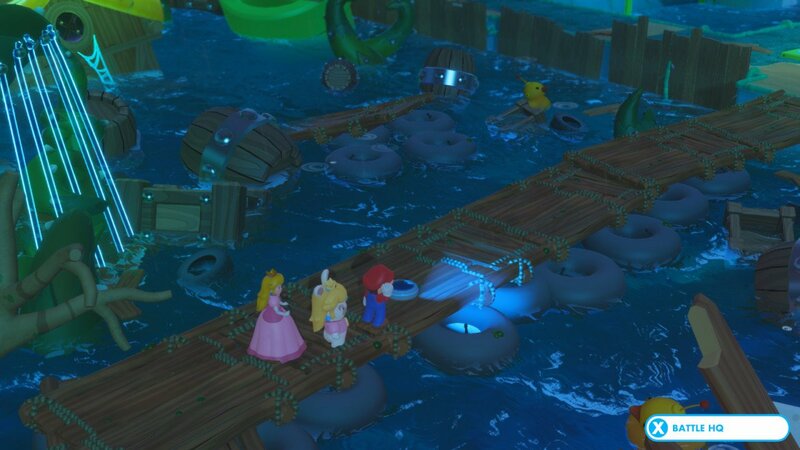 In another frustrating quirk, player parties must contain standard Mario and can’t consist of more than two stars from either franchise, meaning I always had to take along at least one stupid Rabbid and somehow pick only one of the three other Mario characters. Is There Mush-room In This Kingdom? When not battling throngs of raving Rabbid rebels, Luigi and pals spend a good chunk of their time exploring the now even trippier Mushroom Kingdom. Mario + Rabbids is split up into four worlds, each with ten or so chapters, consisting of two or three battles and a bit of exploration and light puzzle solving. Each chapter is self-contained and the game saves and fully heals the party after each one, making this a perfect title for shorts bursts of on-the-go play. Exploration doesn’t amount to much more than moving around each environment from an overhead view as our super-smart idiot teenager friend’s robot sidekick (essentially a glorified Roomba named BEEP-O), with the three current party members following in single file. It’s a strange feeling playing a Mario game where the moustachioed plumber isn’t directly controllable, or even able to jump, but it’s easy enough to get used to. BEEP-O is a tad fiddly to control though, and I often found myself failing timed coin-run sequences for lack of precise movement. Each area is packed with treasure chests to find, either in plain view or hidden behind these time challenges and some short puzzles, and these mostly contain either Power Orbs, new weapons or a robust selection of viewable bonuses like concept art, music and 3D models. After completing each world, BEEP-O is awarded with a new field ability that opens even more opportunities in previously completed areas, and each world gains extra battle challenges to complete, giving great incentive to go back and replay completed locations. Peach’s castle grounds make an appearance as well, serving as the hub in-between each world where new weapons can be purchased, extras viewed in a museum, and a handful of unlockable weapons gained by scanning certain Amiibo figurines (though these aren’t particularly useful). My only gripe here is that the worlds can be confusing to navigate due to the lack of an in-game map, making backtracking a chore on occasion. Where Kingdom Battle’s worlds shine are the inventive and gorgeous realisations of classic Mushroom Kingdom locales. Each world has its own two or three classic visual motifs, including but not limited to, the pleasant one, the fiery one, the barren one, and the spooky one (reads far too much like a list of my past relationships). Mario+ Rabbids looks fantastic in both TV and handheld play; everything is super sharp and impressively rendered, and Ubisoft have done a fantastic job of merging the two worlds in a way that echoes the vibrant, inventive and rhythmic feeling of both of them. Each environment is peppered with sight gags involving the Rabbids causing their usual ruckus throughout the Mushroom Kingdom. Interactions with BEEP-O and the game’s NPCs are equally delightful, deftly mixing the humour of Nintendo’s own role-playing Mario spinoffs and the edgier, more adult gags that the Rayman universe is known for. Toilet humour and bad puns are present here in abundance. The accompanying soundtrack is similarly a great combination of classic Mario themes and more Rayman-esque compositions, most of which I’ve found myself quietly humming over the past week – surely a good sign. I’ll bet nobody had ever wondered, before now, what the world of Nintendo’s most beloved franchise would look like through the lens of Ubisoft’s madcap Rabbids property, but the question has been answered here anyway, and it’s a surprisingly compelling argument for the big N to trust its usually-sacred source materials to developers with the talent and respect to use them in unique and effective ways. Mario and Rabbids: Kingdom Battle is a hugely successful marriage of two properties, that manages to take the best of both worlds and turn it into an accessible yet surprisingly engaging take on a traditionally niche genre. Any concerns that I had going in, be they Rabbid fatigue or a lack of cerebral challenge, disappeared as soon as the game’s addictive and robust battles took hold. It’s a game that’s definitely suited to more experienced gamers, so don’t go buying this for your Mario/Rabbid-loving pre-schooler, but the 20-odd hours you’ll spend in Ubisoft’s version of the Mushroom Kingdom are sure to turn you into a raving fan.